Looking For The Next Revenue Opportunity? Add Total Basement Finishing To Your Business! Learn How Our System Compares! Cost of Total Basement Finishing dealership - Virtually FREE. There are no franchise fees, royalty fees, or contracts to sign. Total Basement Finishing would like to introduce you to an exciting business revenue opportunity that we know will take your business to the next level. For over 20 years, Basement Systems has led the industry as the largest network of waterproofing dealers in the world. After expanding into basement finishing and forming the Total Basement Finishing network, we are now poised to take the number-one spot in that industry as well. Qualified builders and remodelers are invited to join our network and reach the top with us. Once we discuss your interest, I want to invite you to visit our national headquarters for a tour to get to know our company and the many specialists who work here to support you. Other finishing systems (as shown) can lead to water damage repairs. As a Total Basement Finishing (TBF) Dealer you will offer the best of the very best. Home owners know that the cost of building a new home, relocating or building a room or addition is more expensive than ever before in history. When you become a TBF Dealer you can explain to your customers that you can add square footage at a fraction of the cost of them moving or building on. "Your customers will be happy with TBF products because they last a lifetime, are the best value and look great"
"I have been with one of the so called top basement company's for years and when I saw the writing on the wall I came to TBF to be a dealer. Realizing that the product was not better but superior, I became a dealer. I have doubled my figures for the last three years. Any fear one might have, any excuses one might have, is all in your head don't think just do it." "The TBF network gives us a strong advantage in our marketplace. We're able to appeal to customers that want to work with a local company, or a well-established, national company. Trainings, Total Basement Vision software and the variety of products enables us to find a solution for almost every customer we see. We love going to the Owner's Meeting, Convention and other training events to brainstorm with other dealers." "First of all the entire Basement Systems network is the finest I have ever dealt with in my 33 years of remodeling. They are always there to answer questions and respond promptly to calls from me. The training is unbelievable, first rate and enjoyable. 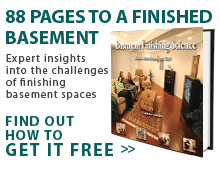 If you follow the training and procedures taught by Total Basement Finishing you will succeed. I feel basement remodeling fits perfectly with our business and it was a very easy add on for us. I enjoy the Total Basement Finishing Jobs the most. I would highly recommend adding it to your business!" The TBF EverLast™ "Maintenance Free VINYL" wall panel is the number one choice and best solution for finishing any basement. EverLast™ wall panels are our state of the art panel that includes SilverGlo™ insulation, radiant barrier and vinyl faced cement/ceramic board. It EverLast™ panels feature everything you need, from a waterproof panel with exceptional insulation value to a timeless look that is maintenance free. The seamless, paintable wall system is a great alternative to the prefinished EverLast™ wall panel. If a homeowner wants to personalize their basement using accent color(s) now they can! This panel also features SilverGlo™® insulation and radiant barrier as a standard property. The seamless, paintable wall system will satisfy even the most creative homeowner.... you are now free to paint or apply wall covers! As a Total; Basement Finishing Dealer you will be able to reface basement walls when full replacement is not necessary. With the NEW TBF wall restoration system you as a contractor wont always have to rip out your customers entire basement, you will have a solution when other contractors dont! The best marketing department in the industry with a print marketing staff, 28-member Internet department, and 6-person video/3D animation department. Quality low-cost leads provided by our Internet department. Website design and search engine optimization services. Regular free trainings for installation, sales and marketing held by experts at our world headquarters in Seymour, CT.
A practiced and proven successful sales program. A support staff of experts available to you every day. Competitive products used by experts such as Bob Villa, Ron Hazelton, and Extreme Makeover Home Addition. Please call me anytime on my personal cell phone at (814) 441-3800, or email me at [email protected] I look forward to speaking with you soon and helping you and your business achieve the highest level of success! For more information on our network and products, visit the Total Basement Finishing website at www.totalbasementfinishing.com! The Total Basement Finishing dealer network prides itself in having the best of the best installing the best! If that sounds like a team you'd like to be part of, please fill out the form below and someone will get back to you about possible opportunities in your area. Only one dealer per territory!